On March 5, 2015, the former USS RANGER began its final voyage – to the scrap yard. The carrier is one of four Forrestal-class super carriers and, while commissioned, it served extensively in Vietnam and the first Gulf War. This ship is famous as the carrier depicted in the opening scene of Top Gun and stood in for the USS ENTERPRISE in one of my favorites, Star Trek IV. Recently, a drone videographer filmed a video of it while the tugs were refueling in Balboa. It is an inevitable but sad part of the life of a ship. The propellers and rudders on the flight deck near the stern illustrate the size of the propulsion system for a ship this large! The video is below. See the end for clips from Top Gun and Star Trek IV. The ex-USS Ranger had been in Bremerton, Washington for the last eight years while the Navy attempted to find a museum or historical society that could accept the ship. Unfortunately, the group could only raise $100,000 toward its $35 million operating budget. So ex-USS Ranger is now on its final voyage. Since it is too large for the Panama Canal, it will travel around South America to Texas. The Navy paid one cent to International Shipbreakers, who will pay to transport it, cut it up, and sell the scrap. I’m sure they’ll have an easier transit than Donfgeng, who I wrote about this month. As the ex-USS Ranger heads to the yard, the Navy performed its first mid-air refueling of Salty Dog 502, one of two X-47-B carrier-based UAS. 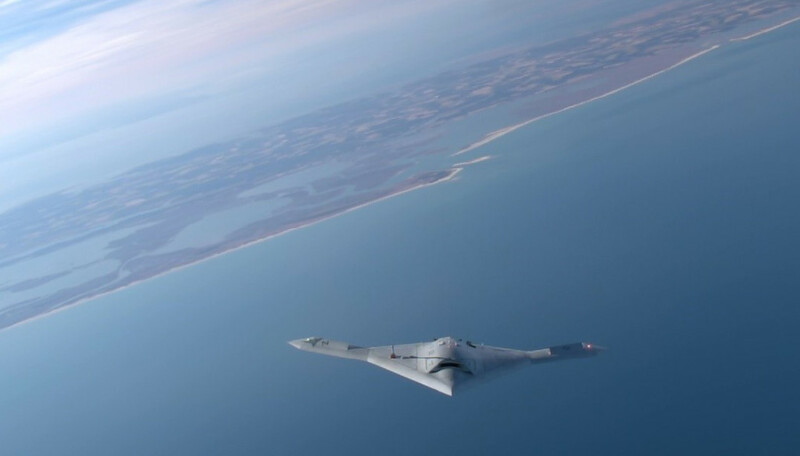 The X-47-B was developed by Northrop Grumman as part of a $635.8 million contract that grew to $813 million, in addition to a $63 million contract for “post-demonstration” development that funded these demonstrations. The Salty Dogs are being retired and the Navy plans to move on to the Unmanned Carrier Launched Surveillance and Strike (UCLASS) UAS. As an aside for government procurement enthusiasts, the ex-USS Ranger contract is considered a “procurement” and not a sales contract, so the government was obligated to obtain the lowest price possible. The metal might be valuable, but the government was seeking a service, specifically the disposal of the ship.